Nightshade Bike STOLEN- please share. If you are in the Vancouver area, or Portland or Seattle- PLEASE be on the lookout for her or her parts. 54 purple Mission track frame, pink vVelocity B43s, Sugino Messenger cranks, was outfitted with platforms and pink YNOT razzle straps. Covered in HMPL, Knog, Orontas, COG, Minorty and Dah Shop stickers, and Ironically a "Don't Steal Bikes Bro" Affinity sticker, although they probably stripped it. Please share this photo. Contact me on instagram or twitter @meglikesbikes or my gmail account by the same name. 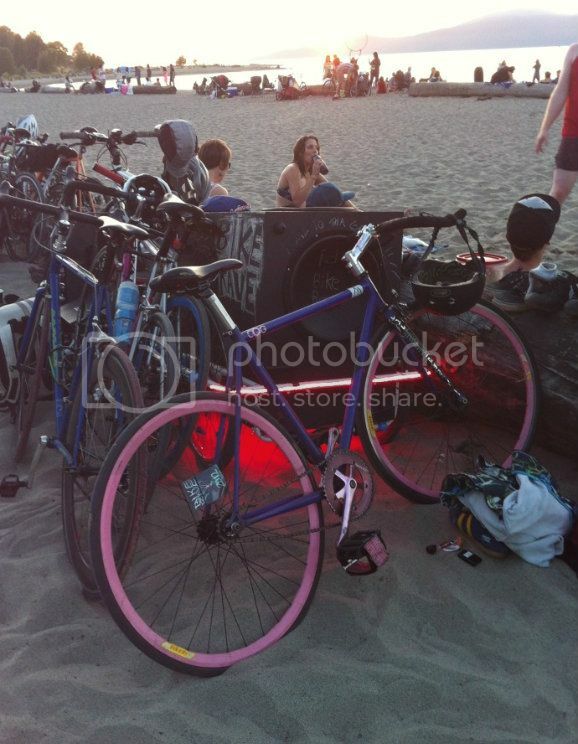 This is Carebear in her natural environment- at the beach with her fellow bike friends. When you are rushing around thinking about superficial things like parties, the cute man who makes info graphics who is in line with you, and optimized bluetooth technology, you can neglect the most important things that bring the MOST value to your life. I am taking this a personal life lesson. I am going to slow my life down and always think about the most important things to me and pay attention to that. I was rushing thinking I was getting the things done I thought I was important, I lost the thing that was the most important to me. I wonder, if everyone was more conscious of this, we'd take much better care of our planet, the children and elders in our society, and talk to our neighbours more. Realizing that computers, things and celebrity gossip is not as important as clean air, nutritious food and community, would probably be a firm foundation for a better planet. I think this is a lesson everyone learns. I think I've had this lesson before, and will probably have again. I just want my baby back. Hey behb; introducing the No 15 Saddle Bag by HMPL. HMPL No.15 Saddle Bag spot #1 from Matthew on Vimeo. My friends here in VanCity can make some really rad beach appropriate bags! I mean, we own the lifestyle. Riding to the beach fully prepared sans bag on your back is massively awesome if you have the kind of frame/lifestyle that doesn't support panniers. I'm in their video 'cause they offered to buy me ciders. This spot is also a prime example of the most excellent quality of lifestyle I am leading out here in Vancouver. It's is pretty much a documentary, not an ad.